The Little Shop of Horrors musical has do-wopped its way onto the North Coast Repertory Theatre stage. With fine singing, comic performances, clever set and costumes and an impressive puppet-monster, it's a diverting evening of live entertainment. With music tied to its early '60s origins in a cult Roger Corman film, a combination Motown trio/Greek chorus (Kathleen Marshall, Jenner Cohune and Chyna Dale) sets the scene: a failing flower shop on Skid Row, where the owner, Mr. Mushnik (Gene Cole) is about to go out of business. But Seymour, the shy but smart shop assistant with a crush on Audrey, the shy but beautiful receptionist, comes up with a solution: an unusual plant to attract customers. He just has to figure out what will make it grow. The answer provides the creepy comedy that moves the story forward. Christopher Hatcher as Seymour and Brandy Rose as Audrey are the charming stars, and Erik Rhea steals the show as the sadistic dentist who rides a motorcycle, affects an Elvis image and causes his girlfriend Audrey to show up at work with various injuries. Exactly how he sings through a gas mask has to be one of the show's technical wonders. There are a number of supporting players, several of whom double as puppeteers when the plant (dubbed Audrey II) grows to major proportions, including Silas Knight, Rigel Schmitt, Alison Ehrstrom and Monica Schallert. Anders Carlson does a tour de force series of bit characters, one after the other. In characterizations and style, the production tends to mimic the 1986 film version of the musical, including some half-hearted "ethnic" humor that has grown creepier over the years. The Corman non-musical original was partly playing off a decade of creature features that included the ambiguous political message and genuine horror of the 1956 classic, Invasion of the Body Snatchers(its 1978 remake was also pretty scary). This musical's Broadway production tried to inject some of the residual horror of that film's ending, but even that was a kind of joke. By now there's not much left of either horror or a message, although there is an undercurrent of "greed doesn't pay" in this story's sentimental shuffling of stereotypes. It's best to just go along for the romp and the tunes. Xande Zublin-Meyer directed the show, with Dianne Zuleger as music director, and a live back-up band. Emily Blanche created the monster (with John Blanche and Delayne Medoff), and NCRT technical director Calder Johnson designed the appropriately tawdry flower shop set. Darcy Daughtry designed a witty array of costumes. My favorite little touches were Audrey's matching skirt and arm sling, and the auto detailing flames on the dentist's smock. NCRT's Artistic Director Michael Thomas tells me that an HSU technical theatre class built the set as a special project, under the direction of stage design teacher Jody Sekas. This is one example of cooperation among local theaters and institutions that seems to be increasing. It's a good idea: sharing resources so each can concentrate on its particular contribution to the life of North Coast theatre. NCRT is also just $10,000 shy of its goal for funding renovations that could begin this month, and perhaps even be completed to celebrate its 25th anniversary season in September. Plans include a new restroom, and a real marquee! The theatre (at 268-0175) is eagerly accepting donations to make it happen. Richard Feynman was one of the foremost physicists of recent decades. His biography by James Gleick is simply titled, Genius. He was also an eccentric individualist in various theatrical ways. British writer C.P. Snow said it was "as though Groucho Marx was suddenly standing in for a great scientist." Feynman played a role in developing the atomic bomb during World War II, and in discovering why the Space Shuttle Challenger blew up in 1986. He became a public figure through television interviews and popular books that expressed his unique approach to science, and to life. Several of those books were the basis for a (mostly) one-genius play, QED, written by Peter Parnell with the active participation of actor Alan Alda, who came up with the idea and played Feynman in its Broadway run in 2001 and 2002. 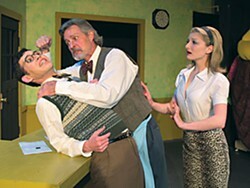 Randy Wayne plays the fascinating Feynman in the Redwood Curtain production, directed by James Read, on stage at the Arcata Playhouse Thursday through Saturday, March 22-24, for its second and final weekend. Wayne, featured in many Redwood Curtain productions as well as other local theatres, holds the stage alone, as we see Feynman in his Cal Tech office, dealing with a physics lecture he has to write, taking phone calls concerning some visiting Russians and crucial personal matters, on an evening he plays a drumming Polynesian in a local production of South Pacific. The only other person to appear is a pretty physics student, played by Melanie A. Quillen. Wayne confidently explains and even illustrates a few physics concepts, while hitting the emotional notes that suggest other colors in this character. Though he doesn't look or sound like Feynman, he does reproduce Feynman's four-syllable pronunciation of his signature word: "interesting." In my view the play tries to do too much, but audiences are in for an entertaining and thought-provoking experience, thanks to the clarity of Wayne's performance. For those inspired to learn more about Feynman, several of the play's anecdotes are even better in the fuller versions contained in his in-ter-est-ing book, Surely You're Joking, Mr. Feynman, and in the TV interviews in "The Pleasure of Finding Things Out," which can be found on YouTube, along with other Feynman appearances. Also: Ferndale Rep enacts two more vintage radio dramas, The Elevator Caper* and *Sorry Wrong Number, this Thursday (May 22) at 7:30 p.m., with Gary Franklin directing. Watch them created live in the theater, or tune in to the broadcast on KHUM. This is the first of several special events substituting for the Rep's cancelled production of Rashomon.